by Scully, Patricia; Stites, Michele L; Roberts-King, Hilary; Barbour, Chandler H.
A comprehensive guide for teachers to establish collaborative relationships with parents/families and the larger community. 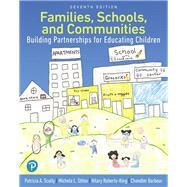 Families, Schools, and Communities: Building Partnerships for Educating Children offers pre-service educators practical guidance to establish strong links with families and the larger community that focus on making the learning experience more productive and more positive for all concerned. It gives school teachers, child care teachers, and other professionals the understanding and tools they need to work with family and community members to give children a rich education. This new edition helps students to develop a firm understanding of the context of children’s and their families’ lives, includes a number of outstanding pedagogical features designed to ensure teaching and learning success, and addresses and highlights areas of critical importance in education today. The Enhanced Pearson eText provides a rich, interactive learning environment designed to improve student mastery of content with embedded videos and self-check quizzes. Patricia Scully has worked in the field of early childhood education in a variety of roles for over 45 years. In addition to teaching in child-care and elementary school settings, she has worked as a child-care center director and as education director of several nonprofit agencies. Dr. Scully is an associate professor at the University of Maryland Baltimore County, where she directs the early childhood program. Her areas of expertise include early literacy, relaxation and stress reduction for children and teachers, and parent and community involvement in education. Michele L. Stites is an assistant professor in the Department of Education at the University of Maryland Baltimore County (UMBC). For ten years, Dr. Stites was a classroom teacher (K—5 and special education), and taught in a number of regions throughout the United States. Prior to her appointment at UMBC, Dr. Stites served as the Early Childhood Intervention (ECI) specialist for a large school district in Maryland. Dr. Stites’ research focuses on inclusive mathematics instruction for young children and family involvement in schools. Recently, her work has been published in the Early Childhood Education Journal and Teachers College Record. Hilary Roberts-King lives in Baltimore, Maryland, and is director of Homewood Early Learning Center at Johns Hopkins University, managed by Downtown Baltimore Child Care. She was an elementary school teacher for over ten years, and is an adjunct professor at the University of Maryland Baltimore County and Pacific Oaks College, where she has developed and taught courses in math processes in early childhood education, early literacy, and child development. Chandler Barbour is a retired professor of Education from Towson University, and now lives in coastal Maine. He worked as a teacher and administrator in elementary schools and universities over a period of 42 years. He and his late wife, Nita Barbour, conceived of and developed this text, which is now in its seventh edition. Dr. Barbour is co-author of three books on teacher and school partnerships.